This example shows the simplest thing you can do with an Arduino or Genuino to see physical output: it blinks the on-board LED. 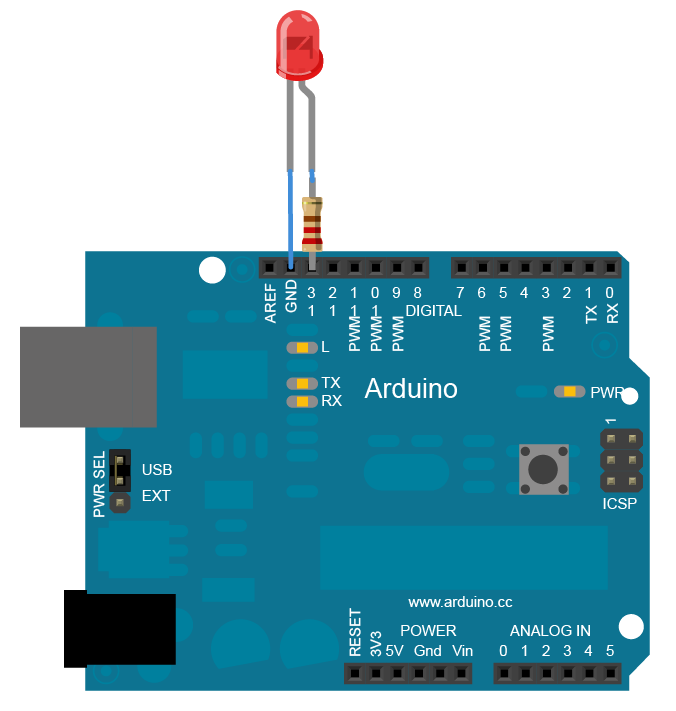 This example uses the built-in LED that most Arduino and Genuino boards have. This LED is connected to a digital pin and its number may vary from board type to board type. To make your life easier, we have a constant that is specified in every board descriptor file. This constant is LED_BUILTIN and allows you to control the built-in LED easily. Here is the correspondence between the constant and the digital pin. If you want to lit an external LED with this sketch, you need to build this circuit, where you connect one end of the resistor to the digital pin correspondent to the LED_BUILTIN constant. Connect the long leg of the LED (the positive leg, called the anode) to the other end of the resistor. Connect the short leg of the LED (the negative leg, called the cathode) to the GND. 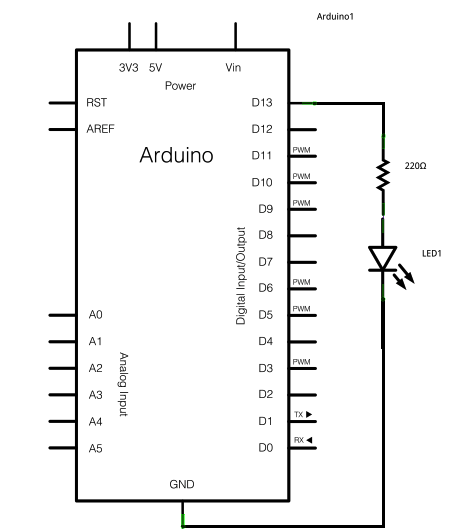 In the diagram below we show an UNO board that has D13 as the LED_BUILTIN value. The value of the resistor in series with the LED may be of a different value than 220 ohm; the LED will lit up also with values up to 1K ohm. That takes the LED_BUILTIN pin back to 0 volts, and turns the LED off. In between the on and the off, you want enough time for a person to see the change, so the delay() commands tell the board to do nothing for 1000 milliseconds, or one second. When you use the delay() command, nothing else happens for that amount of time. Once you've understood the basic examples, check out the BlinkWithoutDelay example to learn how to create a delay while doing other things. Once you've understood this example, check out the DigitalReadSerial example to learn how read a switch connected to the board.